NOTE: ST. PAUL’S CHAPEL IS CURRENTLY UNDER CONSTRUCTION UNTIL AT LEAST 2019. (Statement of Dedication St. Paul’s Chapel 1906). St. Paul’s Chapel at Columbia University provides a venue for hundreds of religious and campus events each year, including worship services, concerts, university and private ceremonies. Visitors come from around the world to see the chapel one of the first buildings in New York City to be designated as an official historic landmark. The chapel is open daily for private meditation and prayer, Monday to Friday, 10am to 5pm. The university was established as an Anglican institution. Thus, a chapel was one of the most important aspects of the school from the time of its founding. Initially, classes were held at the Trinity Church schoolhouse on Broadway and Wall Street, but in 1760, the fledgling institution moved near the Hudson River on lower Manhattan, where it remained until relocating to Park Avenue and 47th Street in 1857. In 1892, Columbia’s trustees acquired four blocks, between Broadway, Amsterdam Avenue, West 116th and 120th Streets on Morningside Heights, from New York Hospital’s Bloomingdale Asylum, in order to erect a new campus. In 1894, architect Charles McKim prepared a master plan for Columbia. This plan focused on an imposing library, with a chapel strategically sited to the east. Initially, no funding was available for the chapel, and it was not part of the academic complex that opened in October 1897. However, in 1903, two wealthy philanthropists, Olivia Egleston Phelps Stokes and Caroline Phelps Stokes, offered to finance the chapel as a memorial to their parents. The Stokes sisters’ one condition was that their nephew, I. N. Phelps Stokes, of the architectural firm of Howells & Stokes, design the building. St. Paul’s Chapel was the first building at Columbia that was not designed by McKim, Mead & White. At first the Stokes’ had promised Columbia $200,000 for the chapel, but they became so enthusiastic about their nephew’s design that they ended up spending substantially more. Construction began on St. Paul’s Chapel in 1904, and it was dedicated in 1907. In 1966, the chapel was among the first buildings in New York City designated an official landmark by the New York City Landmarks Preservation Commission. Written by Andrew S. Dolkart, author of Morningside Heights: A History of Its Architecture and Development (Columbia University Press, 1998). St. Paul’s Chapel is one of the earliest buildings designed by I. N. Phelps Stokes, an architect who had studied at Columbia and at the Ecole des Beaux-Arts in Paris. During a long career, Isaac Newton Phelps Stokes (known as Newt to his friends) designed institutional, residential, and commercial buildings throughout the country and undertook several urban planning projects, but he justifiably considered St. Paul’s to be his masterpiece. The chapel was so important to Stokes that he and his wife had their ashes laid inside; a tablet on the pier to the right of the chancel marks the location. Besides his design work, Stokes served on the New York City Art Commission and compiled the famous six-volume Iconography of Manhattan Island. Stokes designed St. Paul’s Chapel in the space provided by McKim’s master plan, creating a dynamic adaptation of Northern Italian Renaissance architecture. The building is clad in the same red brick and limestone as other campus buildings, but its special character is accented by the use of yellow and white marble highlights. The most prominent feature of the exterior is the dome, pierced by 16 arched windows. The dome’s roof is clad in green ceramic tiles and is crowned by a terra-cotta lantern. Visitors enter St. Paul’s Chapel through a columned portico, above which is carved the Latin phrase Pro Ecclesia Dei (For the Church of God). The portico is embellished with an inlaid marble floor and Guastavino tile ceiling. Each column capital is adorned with a cherub’s head by Gutzon Borglum, the sculptor who later carved Mount Rushmore. The chapel’s central entrance is set within an enframement that is appropriately ornamented with grape vines. Above the doorway is carved Columbia’s motto In Lumine Tuo Videbimus Lumen (In Thy Light Shall We See Light). Magnificent Quattrocento-style bronze lamps, designed by Italian sculptor Arturo Bianchini, flank the portico. The lamp to the left has four statuettes representing prophets of the Old Testament, while that to the right has four apostles of the New Testament. The lamps stand in front of inset scallop shells, a symbol of welcome to pilgrims. On the side facades, Stokes planned four sculpted lunettes, but only sculptor Andrew O’Connor’s southwestern lunette, a gift from Stokes, was ever carved. A gracefully curved apse dominates the rear elevation, overlooking Amsterdam Avenue. The chapel is laid out on a Latin cross plan, stretching 120 feet from the entrance to the end of the chancel. The central dome rises to a height of 91 feet. Stokes succeeded in creating a unique interior where the beauty of the structural materials would be paramount, and there would be no applied plaster or paint. Stokes wrote his aunts that he had designed a building “with nothing false or deceptive, and everything – even the treatment of the interior decoration – structural and permanent.” He carefully selected the salmon-colored Roman brick and designed subtle symbolic detail (vines, figs, shells, etc.) cast in terra cotta tinted to match. The most prominent terra-cotta features are insignias of the four Apostles in the center of the crossing arches, the work of sculptor Adolph Weinman. The terra cotta was manufactured by the Atlantic Terra Cotta Company of Tottenville, Staten Island. The pink-hued tiles of the domes and vaults, laid in a herring-bone pattern, are one of the most significant installations of Rafael Guastavino’s clay tiles. Guastavino was a Spanish immigrant who was influenced by the ancient Catalan technique of timbrel vaulting. After coming to America in 1881, Guastavino patented these structural tiles and established the Guastavino Fireproof Construction Company. The Guastavino tiles can be examined up close beneath the stairways of the chapel’s side entrances. So successful was the use of the brick, terra cotta, and tile at St. Paul’s that in 1907, the Craftsman Magazine declared that the chapel was “an epic in clay.” Stokes also designed the chapel’s floors, with their marble fragments laid in intricate patterns resembling those in the Early Christian churches of Italy; the patterns were purely decorative and had no symbolic meaning. Stokes carefully chose the chapel’s furniture. He preferred moveable chairs to pews, and commissioned the intricately inlaid pulpit, choir stalls, and other chancel and apse furnishings from the Florentine craftsmen Mariano and Figli Coppedé. The bronze chandelier, lighting fixtures, and railings were supplied by Edward F. Caldwell & Company, one of America’s leading manufacturers of custom-designed lighting and metalwork. Around the walls are memorial tablets, also designed by Stokes. The tablets commemorate important figures in Columbia’s history, including presidents Seth Low and Nicholas Murray Butler. The most significant modern addition to the chapel is the Nakashima Peace Altar, in the south transept. The altar, a gift of Professor and Mrs. Wm. Theodore deBary, commemorates Columbians who died in the service of their country. It is the work of master woodmaker George Nakashima, an advocate of peace and east-west rapprochement in religion and art. Stokes requested that the prominent stained-glass artist John La Farge design the three chancel windows in rich dark colors that would harmonize with the brick and tile. The windows center on a scene of St. Paul preaching to the Athenians on Mars Hill. Paul stands in front of the Parthenon, holding an inscription that reads “Add To Your Faith, Virtue.” The presence of the Parthenon serves to remind visitors to the chapel that they are on Morningside Heights, a neighborhood dubbed “the Acropolis of New York.” It is appropriate that the chapel is named for Paul since he was considered the most important teacher among early Christians. The 16 windows in the dome are the work of Maitland Armstrong. These windows, displaying family coats of arms, were gifts in honor of important Columbia graduates, including DeWitt Clinton, William Rhinelander, Nicholas Fish, and Philip Van Cortlandt. 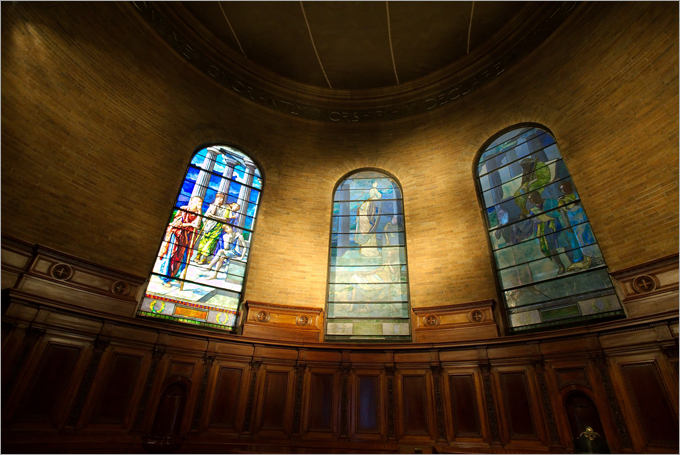 The transept windows by Henry Wynd Young, Jr. and J. Gordon Guthrie, depicting great teachers of the Old Testament to the north and the New Testament to the south, were not installed until the 1920s. The choir room, on the lower level of St. Paul’s Chapel, is lit by three apse windows which may be medieval glass, but more likely are nineteenth-century copies of medieval windows.